Seeing as I’m affectionate to animals and this lady is hot, and has to have an athletic body for this sort of work, and she’s obviously attractive, to her I would say yes. What? nobody mentions rule #34? umm…. work? huh? this is from discovery cove in orlando, fl. anyone with $500 can go for a swim and subsequently make out with dolphins. my exwife and i went there right before we split up. 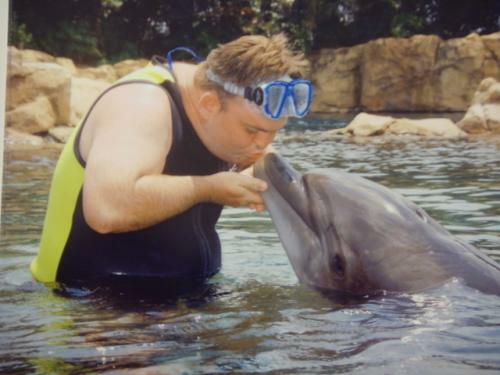 and yes, i kissed a dolphin too. I assumed she was a trainer. It doesn’t change the fact that I’d do her on a dinner table covered in pies. Looking again and seeing the goggles, I can’t believe I thought that. rmx_, if you went there, what does the word after dolphin say on her wet suit? just from the “ce” I’d guess center. People pay $500 to make out with a dolphin? Damnit, I’m going to start my own dolphin kissing booth! Hell, for 600 bucks, I’ll even let them do the nasty. A dolphin bordello isn’t illegal in Florida, right? Wait, did I just read this thread wrong or did you just say rich hot frizzy-haired girl? Because I’m seriously going down to whatever crap state that is with a save the whales t-shirt. Caio, don’t let your jealousy of freedom motivate your posts, it’s getting quite pathetic really. i think this is actually from dolphin cove which is in the bahamas, my dad works for them part time as a veterinarian. 1) Did you just call me a chav? What about my post said to you ‘mancunian with large neon pants’ or ‘urban fabulous’? Just out of curiosity. Ok, I KNOW this was a pic of a chick the last time I looked…now it’s some crazy looking dude? WTF! where did the original picture go? it may be the dolphin cove in the bahamas, but the internet swallowed the picture. wtf? regardless, i doubt the girl was a trainer. (i can assure you that this new guy is not a trainer!) anyone can pay $500 to swim with the dolphins at either location, and there may be more places. there probably are for that matter. perhaps i don’t want to get banned? have you abused this hole before? and thus it shall stay!!! does anyone have the original picture?! HEY EVERYONE….THAT’S NOT A HER OR A SHE…THAT’S A DUDE…..AND I’M PRETTY SURE HE’S ‘SPECIAL’ OR…HAS DOWNS SYNDROME.